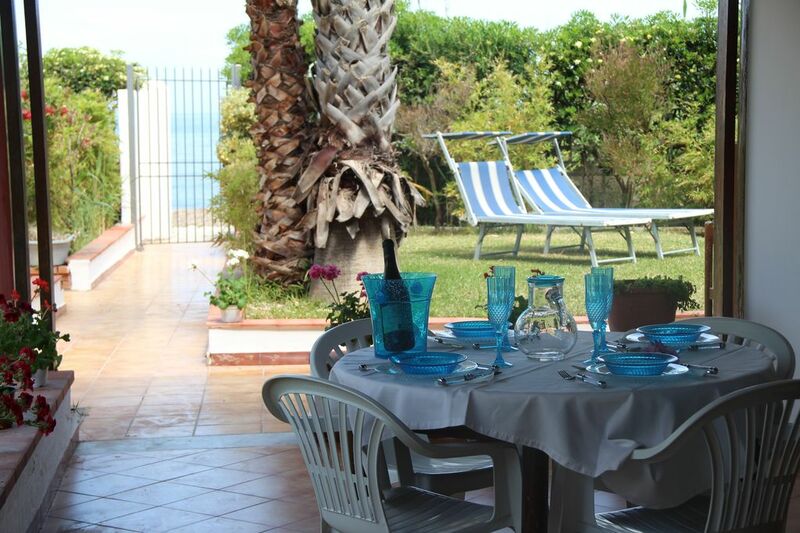 The Chalet is located within a garden with lawn and with direct access to the beach to live in a bathing suit !!! E 'it equipped with veranda for your dinners to' open and for your moments of relaxation. And 'the ideal place to unwind from the busy towns and live with the sound of the sea sunbathing on the beach or on the lawn, but also the base for visiting the city of Palermo or go hiking in the charming towns located in western Sicily ( Erice, San Vito Lo Capo, Marsala, Castellammare del Golfo, Scopello, the Zingaro reserve etc.). It can 'accommodate up to 4 people (double bedroom + bedroom with bunk-conditioned area). It has a living room / kitchen with TV and WI FI access, bathroom with shower. Outside shower, veranda, terrace and barbecue. Guests will find this' they need for a comfortable stay (sheets, towels, dishes). The house has its own entrance and private parking (you may want to hire a car for travel) and garden available to guests. The Chalet is located at a KM from the motorway Carini, 10 minutes from Falcone Borsellino airport, 10 km from Palermo. Nearby a shopping center for purchases and a petrol station. In proximity to the beautiful villages of Isola delle Femmine (where you can buy fresh fish directly at the marina) or Sferracavallo and country of Carini with its famous castle (the castle of Baroness Carini). We spent a week in Carini and felt very well in the house. Especially the hospitality and friendliness of the homeowners have impressed us and we would like say: "Thank you very much for such a nice holidayand we will come to you again." Für alle deutschen Interessenten: Wir waren eine Woche in Carini und haben uns sehr wohl gefühlt. Trotz unseres schlechten Englisch gab es keine Verständigungsschwierigkeiten und die Hilfsbereitschaft und die vielen guten Tipps der Eigentümer haben dazu beigetragen, dass wir den Aufenthalt sehr genossen haben. Das Preis-Leistungsverhältnis ist sehr gut und durch die Lage ist man mit dem Auto sehr schnell und einfach an vielen Sehenswürdigkeiten und kann die Umgebung gut erkunden.